CM-333/CYU-333 is a high quality format converter designed to convert from component video (Y, R-Y, B-Y) to the Scart RGB. 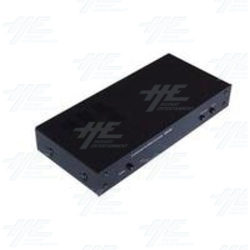 This allows the highest quality video to be displayed on a TV equipped with an RGB Scart type connector. Converts YCbCr signal ( from NTSC/PAL DVD for example) to RGBs Scart, for connecting to the input of TV or A video monitor, to view the image in high quality picture. It can set TV to Video mode through scart output. Input selectable between VCD( Scart) and DVD (YcbCr) sources.